It has been a long, cold winter in the Northeast United States. Here we are a week into June and my sweaters still aren’t fully packed away. My backyard thermometer registered 58 degrees this morning. Brrr! As if to drive home this point, my farmers’ markets are still awash with apples, potatoes, and fennel, typically late autumn to early spring fare. The way I see it, there’s a silver lining to everything. And this pretty spring salad featuring the aforementioned fennel has certainly helped me find one here. I’ve quick pickled baby fennel with rice wine vinegar and sugar. I only needed about 20 minutes sitting time for it to achieve the lightly pickled state I was looking for. I wanted it to retain a nice crunch. This salad also features olives purchased from local vendor Pickle Licious. The olives are brined with jalapenos so they add nice heat and complexity to the dish. Fennel pairs up perfectly with an oily fish, the obvious choice being salmon. But my heart belongs to arctic char, a fish that marries the best qualities of trout and salmon. If the cool, rainy weather is still holding out, you may want to cook your fish under the broiler. But if there’s a break in the nasty weather, take your fish outside and grill it on a cedar plank. You’ll almost have yourself believing that summer is just around the corner. In a medium saucepan over medium-low heat, combine the vinegar, granulated sugar, and salt. Heat, stirring and without bringing to the boil, until the sugar and salt have dissolved. Place the fennel in a medium bowl and pour over the vinegar mixture. Let sit at room temperature for at least 20 minutes, stirring occasionally to make sure all the fennel is coated. Drain the liquid and discard. Add the tomatoes and olives and stir to combine. Meanwhile, in a small bowl, combine the brown sugar, cumin, coriander, celery salt and pepper to taste. Stir to combine well. Sprinkle each arctic char filet with the spice mixture. When the grill is hot, place the arctic char, skin-side down, on the soaked and greased cedar planks and place the planks on the grill. Cook, covered, until just cooked through, about 8 to 12 minutes. My family likes their fish very, very rare so I usually cook it no more than about 10 minutes. Remove from the heat and carefully lift the filets off the cedar planks. The skin may or may not stick to the plank. If it does, that’s fine just lift the meat away from the skin. Serve with the fennel and tomato slaw. * A note about cedar planks: Check the directions on the cedar plank packaging. Depending on the brand, they will need to be soaked for 20 minutes or up to 1 hour. There are also some brands that come pre-soaked. After soaking, I wipe the plank down with a paper towel to dry it then wipe it with an oil-soaked paper towel to grease it. I cooked the arctic char over direct heat for 4 minutes then moved the plank to indirect heat for the remainder of the cooking time. 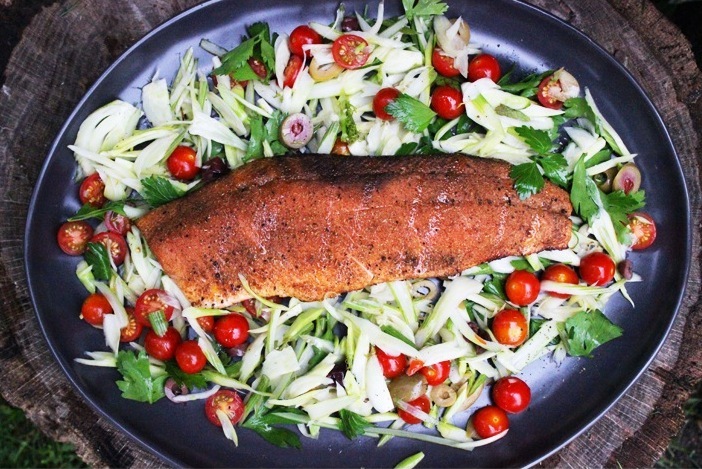 This entry was posted in main, salad and tagged arctic char, fennel, fish, grilling, pickling, slaw, tomato. Bookmark the permalink. I think I may be making this tonight with your spring risotto recipe! I made this last night with wild salmon and it was delicious!! Loved the fennel slaw ! !